A man who volunteered to be the first person to have a head transplant has changed his mind after meeting the woman who would go on to become his wife and having a baby. 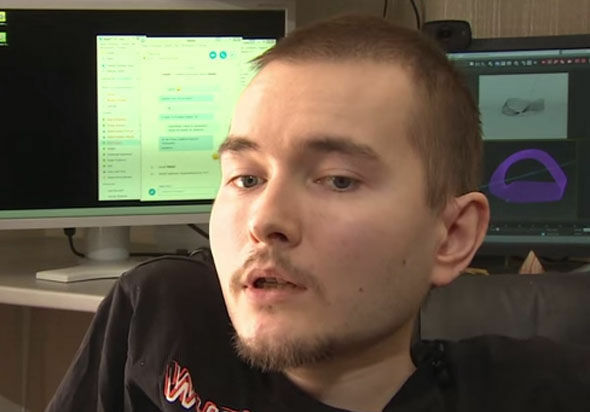 Valery Spiridnov – who suffers from muscle-wasting disease Werdnig-Hoffman, which shortens life expectancy – previously put himself forward for the unprecedented surgery because he had nothing to lose. He said: “I understood that it was a great risk, that it had never been done before. But now it seems he does have something to lose – namely his wife, Anastasia Panfilova, and his ‘beautiful kid’, who was born in November. Speaking on Good Morning Britain, the 33-year-old Russian said: “My condition seems stable and some plans changed and in my life appeared a woman, who I fell in love with and I’m happy to say I’m married and have a beautiful kid now. The head transplant surgery is the brainchild of Italian doctor Sergio Canavero, who has reattached the heads of monkeys and is currently carrying out further research in China. He also previously claimed the procedure had been successfully performed on a corpse, but it later transpired this was just the ‘first surgical model’, not an actual transplant. He believes it isn’t true that the severance of a head means certain death, while large swathes of medicine disagree with Canavero, who has been dubbed ‘Doctor Frankenstein’. He announced in December that he had changed his mind about the op, but only revealed today that the decision had been motivated by his newfound family life in the US, saying: “I have become a really happy person. “I have moved to the United States and I’m getting my Masters degree here. In 2017, Professor Ren Xiaoping said his team had successfully conducted a head transplant experiment on a dog. He claimed his team in China were able to successfully re-connect the spine with the new head using a chemical compound called polyethylene glycol. He said the dog could start to walk two weeks after the operation and run two months after the operation. One year on, he described the result of the experiment as ‘very good’, but did admit the lab dog wasn’t acting like a completely normal dog. Hmmm… Can’t help but feel Mr Spiridnov might have made a good call on the head transplant front, for now at least.